PETER C. BRINCKERHOFF is an internationally renowned trainer,author, and consultant to not-for-profit organizations. He bringsyears of experience in the field to his work, as he is a formerboard member of local, state, and national not-for-profits and hasworked on the staff and as executive director of two regionalnot-for-profits. Since founding his consulting firm, CorporateAlternatives, in 1982, Mr. Brinckerhoff has helped thousands oforganizations become more mission-capable. 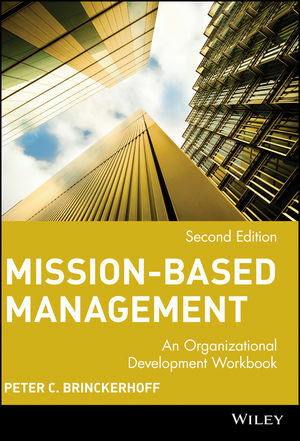 Peter is the author of the award-winning books Mission-BasedManagement and Financial Empowerment as well as Mission-BasedMarketing, Faith-Based Management, and Social Entrepreneurship, allpublished by Wiley. Peter's books are used as texts inundergraduate and graduate programs in not-for-profit management atover 60 colleges and universities. A former VISTA volunteer, Peter received his bachelor of artsdegree from the University of Pennsylvania and his master's degreein public health administration from Tulane University. He lives inSpringfield, Illinois, with his wife and three children. Introduction: How to Get the Most out of this Workbook. Leading Group Discussions: A Primer. Benchmarking Your Organization: A Baseline Self-AssessmentTool. The Mission Is the Reason. A Businesslike Board of Directors. Developing a Bias for Marketing. Controls That Set You Free.